Every single social media practitioner, guru, wizard (or warlock) out there tells you that the key to success is listening. “We have two ears and one mouth for a reason” has been repeated so often it’s axiomatic. But what does listening really mean today? To tell someone to “listen” is such a vague piece of counsel that it renders it devoid of any usefulness. How do you listen? Where? To whom? For what purpose? These are the questions that businesspeople ask in the real world, and we’re going to answer them next week. I have assembled an all-star cast of business thinkers to help me add much-needed specificity to the “Listen” maxim, and the five of us are coming together on one, 60-minute Webinar on October 20 (sponsored by Cision). RSVP here. Each of these experts possesses many years of experience guiding companies on how to listen effectively in social media. This is going to be one of those rare Webinars that is FULL of insights and information that is actually usable in your day-to-day life. RSVP here. To give you a preview of the Webinar, we’ve created with Cision a Slideshare presentation with some of the key themes covered. This is just an excerpt, however. A full, free ebook covering the entire Webinar topics is also available (click the link on the last slide below to get a copy sent to you). 3. Register for the Webinar on October 20. It will be recorded if you can’t make it live. 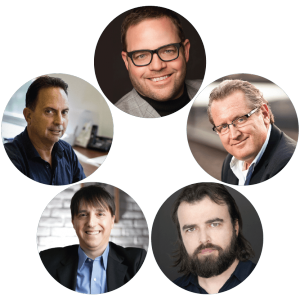 Please join me, Neal Schaffer, Mark Schaefer, Jeff Bullas, and Scott Stratten (and Cision) on this huge, free, educational Webinar.